If Christians want to see an awakening and revival, then they need to not only pray, but actually go out into the world and get to work. That was the message of The Send, a charismatic mega-event that continued without ceasing for nearly 12 hours straight on a sweltering Saturday in Orlando, Florida. According to Youth With a Mission’s Andy Byrd, 59,000 people attended the free event, held in the Camping World Stadium, and peak attendance at one time was 40,000. “We are here because we are crazy enough to believe that we are called for the greatest move of God in human history,” said Byrd. The Send is not led by any one individual or ministry. 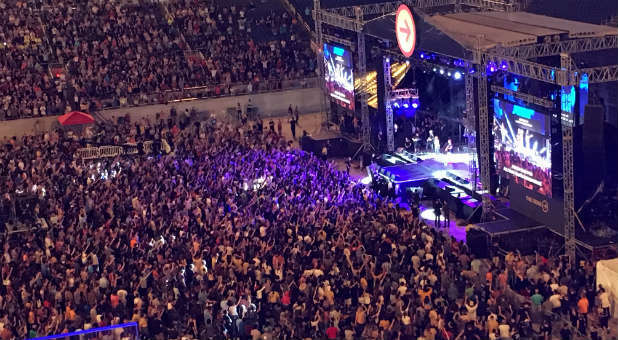 At one point during his message, Francis Chan wryly remarked how unfair it was that The Send attendees got “20 speakers and 15 bands” while there are people around the world who have never heard the gospel. Regarding neighbourhoods, Liebscher and Chan urged Christians to take everyday evangelism seriously, emphasising it as a matter of personal responsibility. Liebscher said many believers, without knowing it, approach church with a worldly mindset rather than a kingdom mindset. He says people often come into church not wanting to be equipped but wanting the church to do their Christian life for them. But Liebscher said that doesn’t work for church, because God explicitly demands certain things from every one of His disciples: praying for the sick, widow and orphan care, discipleship, generosity and evangelism. “I believe God’s message today is first be faithful in your neighbourhood,” Chan said. “Do the people on your block know what you believe and that you love them? Have you warned them about who they’re going to face? Have you told them they can have peace with God? If not, why would he want to send us somewhere else—to not do the same thing in another language? Francis Chan concluded the segment with a prayer reminding all in attendance they are adopted too: “You are a Father to the fatherless, and You want us to be the same. How can the love of God be in us if we pass by those who are in need? I ask your forgiveness, Lord, for not thinking about all these children who are in need. What a great message conveyed at The Send. A timely message for this hour and further confirmation time is running out to preach the GOOD NEWS. I hope it challenges you, as it did me.